I just love it when you all share the deals you find around town. It’s difficult for Rebecca & me to make it out to discover new deals — as many of you know, doing anything with little ones is oftentimes challenging! **This is a great item to pick up for Christmas! Way I see it, you WERE buying the refills, even if at a cheaper price. But again, the manufacturer could have covered that issue buy saying the above disclaimer…if the qs don't say that, you should have been able to use both, or she should have at least tried. The diffusers are on sale at Walgreens for $5 and so are the large candles (I think the coupon is for those too). I went to Target (Keiser, OR) today to get some Airwick refills for my office. Since it's for work, I wasn't worried about getting the bestest of best deals. I wanted to use the $1/1 double refill pack and the Free Airwick Warmer WYB a refill coupons from Sunday's paper. The clerk said I could not use the Free WYB coupon because I was using a coupon on the refill packet. I asked if she could scan the coupons and see if The System would accept them both. She said no, she knows the rules and I can't use the coupon because it requires me to buy the refills and I was using a coupon on the refills. Say what? I didn't want to mess with it so I didn't get the extra warmer or use the coupon. Can any other "Couponers" explain this to me? Thanks! 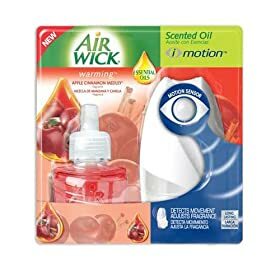 The $6 coupon I have for Airwick is on the "ULTRA" i-Motions. The ones that are on sale are the smaller compact I-Motions. You can use the $4 off coupons for those making them a buck which is still good, but the $6 one shouldn't work for those. The "Ultra" i-Motions were a little over $9 this morning at WalMart.